Pendants are one of the earliest types of body jewellery worn by mankind. 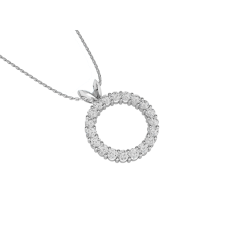 Among our designs you can find classic single stone pendants, but also multi-stone pendants for more brilliance. For a bit of whimsical romance you can select from our heart, starburst, or cross shaped cluster pendants. You can decide to purchase the pendants with or without the matching chains. 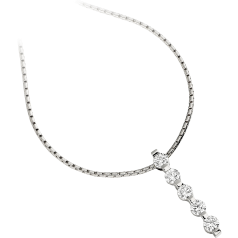 Each pendant and necklace is made out of a stunning white gold of 9ct or 18ct. We offer a range of pendants and necklaces set with the most popular shapes of diamonds, the classic round brilliant cut diamond and the square princess cut diamond, which has been gaining popularity from the second half of the 20th century. In our collection you can also find pearl pendants and necklaces, to match with our dreamy pearl drop earrings. Our delicate pearl pendants are sure to make you feel like a 1930s movie star. 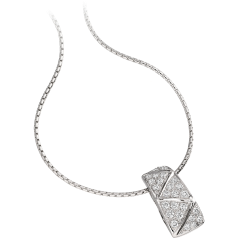 A classic chic diamond pendant and necklace is a staple piece every woman should own. 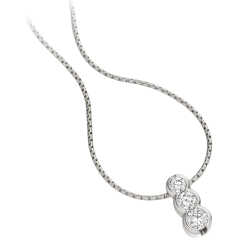 A sparkling pendant on a dainty necklace is appropriate for both day and night, and it is sure to transform any outfit. It can dress up a basic dress or t-shirt and jeans, can be stylish with a silk blouse, or worn with a cocktail dress a diamond pendant is the right jewellery for a formal event. 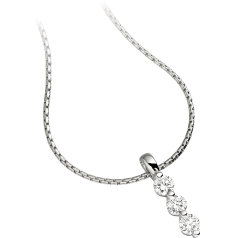 Our dazzling diamond pendants speak for themselves. The diamond pendants and necklaces presented on our site come in an elegant presentation box, inside an outer gift-style box with a silk ribbon, ready to be given as gifts for any occasion, at any age. Our high quality handcrafted pendants and necklaces are real investments for the wardrobe, and you will be able to wear them for many years to come.